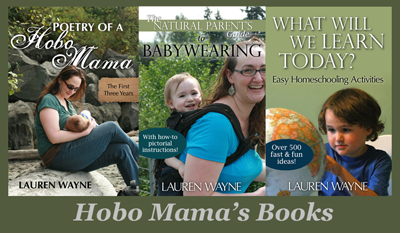 Hobo Mama: Cover that up! It's disgusting. This picture you used to illustrate this post is one of my favorite bf images. I'm with you, I want public bf to be normalized so people stop making a big deal out of it. It means we have to be brave, even if we are worried about judgments, and do it anyway. I try so hard to not be judgmental, either. One time at church I saw a mom bottle feeding her baby and wondered why she didn't bf him. I thought he was about 9 months old. I found out later that he was 17 months and just very small for his age (and also slow on the whole crawling/walking developments). For all I knew, she could have bf him for an entire year or more, which at this point, is commendable. Sure, if it were my baby, I'd still be bf him, but sadly, our culture just isn't there yet. That's another good illustration that I'll remember next time I'm thinking of judging! I go back and forth on whether I want to be less judgmental or not, because I think judging in terms of discernment once the facts are known is useful, but judging out of ignorance and with a negative point of view from the outset isn't helpful. Like your saying you would still be bfing that baby if he had been yours is a judgment of sorts, but a thoughtful one that acknowledges that you don't know all that mother's been going through. Maybe I need to come up with different terms than just "judging," which can be either good or bad: discerning vs. criticizing or something? To cover or not to cover? I think there can be many issues that go into each mama/baby pair's use or non-use of nursing covers, so I just thought I'd share a little bit of our experiences NIP and how we've morphed from using a nursing cover to proudly nursing without one (I am LOVING your blog by the way :) ). Our baby girl is now 5 1/2 months old, nurses like a champ 'round the clock, and will have nothing to do with nursing covers. That's cool, I'm game - they're a pain to manuver and it's like sending up a flare: "Right here! Nursing! Come look!" However, when our daughter was tiny I was 1)Having some serious overproduction issues (i.e. the dude 3 feet away would get wet if our baby pulled off), 2)I am ummm... rather well endowed so discreet nursing took some serious practice and extra-baggy shirts, and 3)I think our child is part wiggle-worm (she's been non-stop motion since before we first laid eyes on her at our 9-week ultrasound). These 3 challenges added up to using a nursing cover until 1)the production calmed down a bit, 2) I figured out the whole baggy shirt thing and how to help her latch without having to actually SEE her latch, and 3) She quit pulling off so frequently in her wild waving. It's been quite the learning curve, but we've finally managed to learn how to proudly NIP (and without that pesky cover)! Midwife Mama: I really appreciate your story. It's so good to hear true reasons why someone covers and then gradually decides not to cover. I think the important thing is that every mama decides what works and goes for it. I finally have a lot of friends having kids now (we were somehow the pioneers), and I notice that most of them breastfeed their newborns under a cover. I'm patient with it, because I remember those early days of getting used to it all, and I hope it's not that they'll always feel uncomfortable. Anyway, thanks for sharing! I love that you'd have soaked the guy 3 feet away. :) That's some serious milk fountain! I know this post is almost a year old, but I found your blog from a Facebook post and wanted to speak as a bottlefeeder in case you ever see this again. I do hide the fact that I bottlefeed in public. Not so far as to put a blanket over us (though I admit I always want to), but I will hide in the car or turn away from people and tuck her in like she is breastfeeding. We live in Portland, which I'm sure you know is extremely BF friendly, plus I went to a birth center that has a whole community built around it where basically no one has ever not breastfed. And while I know probably no one is judging me, I feel the shame and people just looking at me reminds me of all the terrible feelings of not being able to BF. @Cassandra: That is really interesting. Thank you for commenting. I've been in situations where I'm the only breastfeeding mama in a room of bottlefeeders (and I'm in Seattle, another crunchy city), or the only one not covering up, or just where I'm out in public and certain everyone's staring and judging me — I wonder if it's just our own sense of fear and imposed shame from the culture of "The Mommy Wars" that makes us assume that everyone around us is on the opposite side. 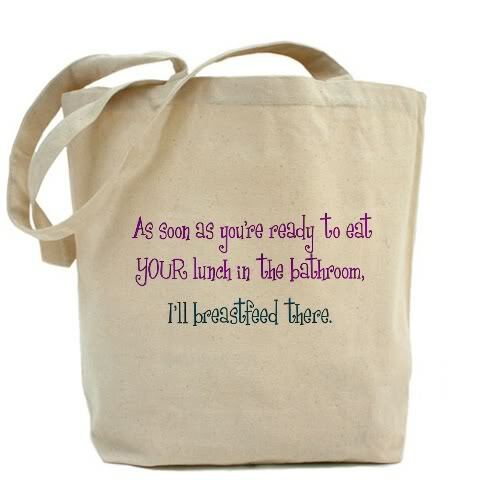 Maybe the bottlefeeding mamas I was around were afraid I was judging them, and I just assumed the reverse, you know? Anyway, thank you for the food for thought. I hope we can both go about our children's feedings in peace and try to assume other people are thinking the best about us (and I sincerely hope they are).